After falling to historically low numbers during the last recession, the pickup truck market has rebounded. Ford, General Motors, Chrysler, Toyota, Nissan and Honda each participate in this segment, serving up a variety of vehicles to meet consumer demand. While Chrysler serves up Ram trucks, its Jeep division hasn’t had a model in decades. Volkswagen is a one-time player too, but it also lacks a model. Both manufacturers are weighing their options, considering what choices they have to get back in the market. The following are among the ideas that may make this possible. Jeep built the J10 pickup truck from 1971 to 1988. When it came to the end of its product cycle, Jeep was no longer part of American Motors, but firmly in Chrysler’s camp. And with Chrysler heavily vested in developing a new truck for Dodge, Jeep was left without a model of its own. The Jeep Gladiator concept was developed in 2005 in a bid to gauge customer interest. The interest was there, but the DaimlerChrysler marriage was in trouble and headed for divorce. A healthier company probably would have developed this vehicle, but the timing just wasn’t right for Chrysler. Jeep appears likely to get a pickup truck and a model based on the current Wrangler. At a special automotive event in Utah in 2012, Jeep showcased the J-12, itself based on a modified Wrangler body. It has a traditional look, a midsize truck concept that find niche customers if it is ever built. A 3.2-liter V-6 gasoline engine would be a natural fit as would the Italian-supplied 3.0-liter turbo diesel found in other Chrysler products. 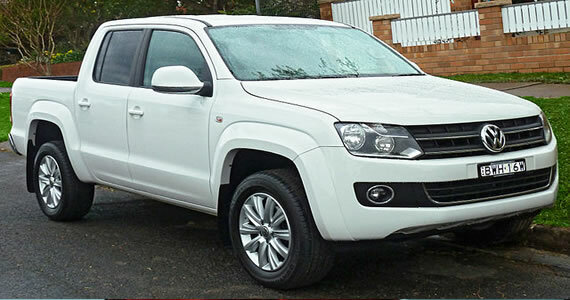 Have you ever heard of the Volkswagen Amarok? Only if you are diehard VW fan. That pickup truck is of unibody construction and has been sold in dozens of markets beginning in 2010, but it isn’t available in North America. Volkswagen would love to regain the toehold it once enjoyed with its 1980s-era pickup truck based on the Golf/Rabbit platform, but it hasn’t made a commitment yet. The Volkswagen Amarok would complete against other midsize trucks including the Chevrolet Colorado, Toyota Tacoma, Nissan Frontier, and the Honda Ridgeline. Unfortunately, the Amarok may be too small to make much of a difference. It is powered by gas and diesel engines displacing at just 2.0 liters, which are quite small for today’s trucks. What Volkswagen may do is develop a pickup truck exclusive to the North American market. That would require a significant investment in resources, at least $1 billion, with no guarantee of a sure return. One way to accomplish this goal without busting the bank is to share product development with another manufacturer. And with Hyundai and Kia both desiring to enter the market, a joint-development could be in the works with its Korean competitors. Both Jeep and Volkswagen might jump back in the market if the newly reintroduced Chevrolet Colorado and GMC Canyon succeed. Some manufacturers have given up on the small truck segment, but Toyota and Nissan haven’t. With GM now the third manufacturer battling it out, if sales rise across the board, then additional players may commit. Erin is a professional blogger that provides tips and information on franchise opportunities and investments. He writes for Franchise Expo, the place to find the best franchise opportunities available.